Atmospheric condition is generally satisfactory for culture of aerobes or facultative anaerobes but for the growth of many aerobes, it is necessary to provide extensive aeration. Forced aeration of cultures is therefore frequently desirable and can be achieved either by vigorously shaking the flask or tube on a shaker or by bubbling sterilized air into the medium. When aerobic organisms are to be grown in large quantities, it is advantageous to increase the exposure of the medium to the atmosphere. This can be accomplished by dispensing the medium in shallow layers or by providing aeration by constantly shaking the inoculated liquid cultures. Main Principle: reduce the O2 content of culture medium and remove any oxygen already present inside the system or in the medium . Oxygen is ubiquitous in the air so special methods are needed to culture anaerobic microorganisms. A number of procedure are available for reducing the O2 content of cultures; some simple but suitable mainly for less sensitive organisms, others more complex but necessary for growth of strict anaerobes. Bottles or tubes filled completely to the top with culture medium and provided with tightly fitting stopper. Suitable for organisms not too sensitive to small amounts of oxygen. Addition of a reducing agent that reacts with oxygen and reduces it to water e.g., Thioglycolate in thioglycolate broth. After thioglycolate reacts with oxygen throughout the tube, oxygen can penetrate only near the top of the tube where the medium contacts air. Obligate aerobes grow only at the top of such tubes. Facultative organisms grow throughout the tube but best near the top. Microaerophiles grow near the top but not right at the top. 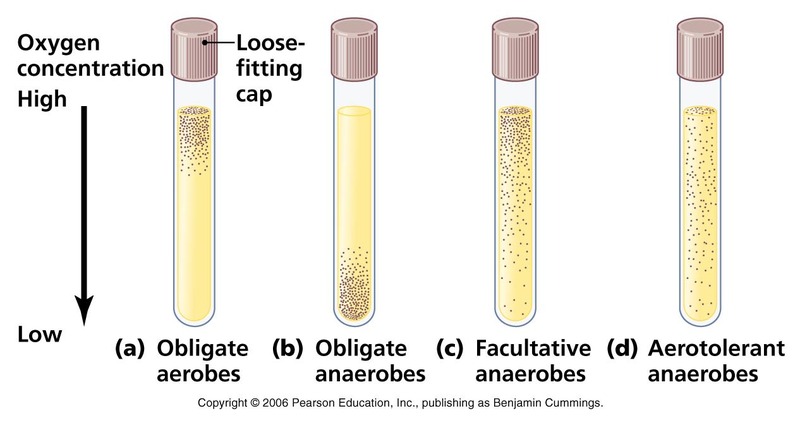 Anaerobes grow only near the bottom of the tube, where oxygen cannot penetrate. A redox indicator dye called resazurin is added to the medium because the dye changes color in the presence of oxygen and thereby indicates the degree of penetration of oxygen into the medium. Strict anaerobes, such as methanogenic bacteria can be killed by even a brief exposure to O2. In these cases, a culture medium is first boiled to render it oxygen free, and then a reducing agent such as H2S is added and the mixture is sealed under an oxygen- free gas. All manipulations are carried out under a tiny jet of oxygen free hydrogen or nitrogen gas that is directed into the culture vessel when it is open, thus driving out any O2 that might enter. 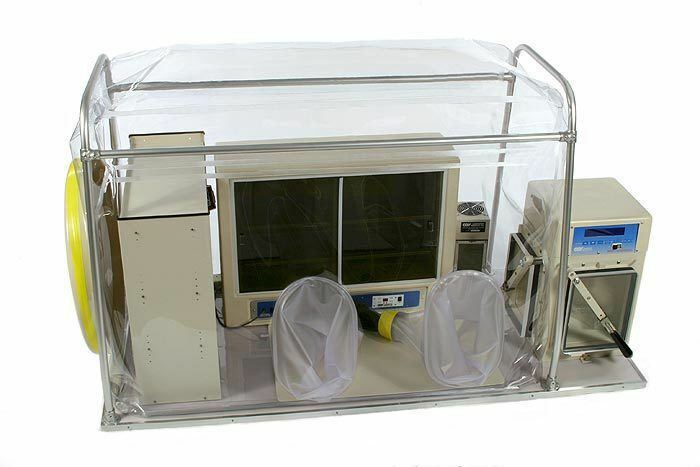 For extensive research on anaerobes, special boxes fitted with gloves, called anaerobic glove boxes, permit work with open cultures in completely anoxic atmospheres. During preparation, the culture medium is boiled for several minutes to drive off most of the dissolved oxygen. A reducing agent e.g., cysteine, is added to further lower the oxygen content. Oxygen free N2 is bubbled through the medium to keep it anaerobic. The medium is then dispensed into tubes which are being flushed with oxygen – free nitrogen, stoppered tightly, and sterilized by autoclaving. Such tubes are continuously flushed with oxygen free CO2 by means of a cannula, restoppered, and incubated. This refers to a plastic anaerobic glove box that contains an atmosphere of H2, CO2, and N2. Culture media are placed within the chamber by means of an air lock which can be evacuated and refilled with N2. Any oxygen in the media is slowly removed by reaction with hydrogren, forming water; this reaction is aided by a palladium catalyst. After being rendered oxygen free, the media are inoculated within the chamber (by means of the glove ports) and incubated (also within the chamber). Anaerobic jar is a heavy- walled jar with a gas tight seal within which tubes, plates, or other containers to be incubated are placed along with H2 and CO2 generating system (GasPak system) . 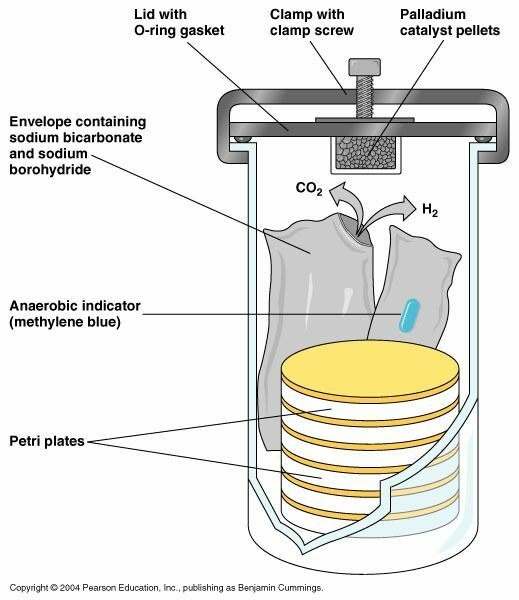 After the jar is sealed oxygen present in the atmosphere inside jar and dissolved in the culture medium, is gradually used up through reaction with the hydrogen in the presence of catalyst. The air in the jar is replaced with a mixture of H2 and CO2, thus leading to anoxic conditions. I have a question…In my micro class we discussed the different classifications of bacteria based on oxygen preferences. we were told that if we inoculate an anaerobe and an aerobe into separate tubes of nutrient broth, the aerobe grows well, but the anaerobe wont be able to grow unless anaerobic conditions are established. This made sense to me completely, however we were then told that if the two microorganisms were inoculated together, they would both grow. I do not understand how that is possible. Are you able to explain that concept further? The nutrient broth contains oxygen, so the aerobe grows well but the presence of oxygen (oxygen toxicity) kills the anaerobes. In the second case, if you inoculate both aerobe and anaerobe together. First aerobe will utilize the available oxygen in the system and may generate anaerobic condition. After that anaerobes can grow. Hopefully this makes sense to you. I want to know about the Gaspak system in detail.I mean chemicals used in the process and their roles.Please! If I need to check out the content claimed in the commercially marketed probiotics whats the procedure to be followed to identify their number of CFU and Bacterial species. what are the procedures to grow anaerobic bacteria?